October marks the beginning of flu season in North America and “get your flu shot here” signs are popping up all over the place. The earlier you can get vaccinated, the more protected you will be throughout the season, which runs from October through May. Vaccination is recommended for everybody six months of age and older but it’s especially important for babies and small children, pregnant women, the elderly, and anyone with underlying medical conditions that weaken the immune system. It takes the better part of a year to develop and produce enough flu vaccines to serve the population so the vaccine you’ll get in coming weeks began development last winter. There are many different strains of influenza virus but usually only one or two are active during any one season. Health officials monitor the worldwide spread of influenza to identify which viral strains are causing illness and use that virus to produce the vaccine. Most vaccines protect against two or three different strains. Last year after vaccine production was in full swing, one of the targeted viruses mutated, making the vaccine less effective than desired. That was a rare occurrence that led to more illness than usual. The Centers for Disease Control and Prevention (CDC) say the vaccine for the 2015-2016 flu season is right on target and should provide better protection this year than last. No mutations have been discovered as the influenza virus makes its annual journey around the world. Get vaccinated. No one leaves the vaccination procedure with full protection. It takes a while for the body’s immune system to identify the virus and build immunity to it. Exposure to the virus before vaccination and for a week or two after vaccination may cause illness since the body is exposed before full immunity develops. Get vaccinated before anyone you know gets sick so you’ll be fully protected when the virus hits your community. Wash hands often, especially after coming in contact with others, even if they don’t exhibit symptoms. Use disposable tissues after every cough or sneeze. Don’t reuse them. Avoid contact with people sick with the flu. Change your meet-and-greet style. Instead of a handshake, hug, or kiss, try a smile, a friendly wave, or even a quick fist bump. Avoid contact with other people’s hands and faces as much as possible. Keep hands away from eyes, mouth, and nose. This is where the virus enters and infects the body. 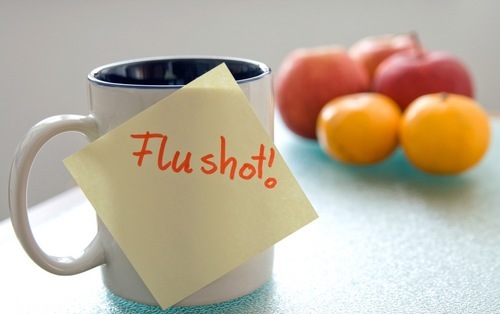 Stay as healthy and well-rested as you can during flu season. Don’t practice presenteeism. Heroes don’t come to work sick; they stay home until they’re safe and well again. Going to work, school, or anywhere while sick only spreads germs, inhibits production, and makes you feel even more miserable. Stay home. Take care of yourself. Be mindful of others. Ask about antiviral medications. These drugs minimize the severity of the flu and help it pass more quickly. Contact your doctor at the first sign of illness or if you are taking care of someone sick with the flu. Different influenza virus strains are active each year. A vaccine from years’ passed will not protect against illness a second year. Get vaccinated as early as possible every fall to enjoy winter and spring free of the flu. "What You Should Know for the 2015-2016 Influenza Season." CDC / Centers for Disease Control and Prevention. US Department of Health & Human Services, Aug. 2015. Web. 22 Sept. 2015. "Prevention." Flu.gov. US Department of Health & Human Services, n.d. Web. 22 Sept. 2015.